When Glitter Guide asked me to share my workspace in a recent article on their site, it couldn’t have come at a better time. You see, Drew and I were about to start packing our home into boxes as we made yet another move (the joys of having a husband who can build a home in his spare time). Before I left this space that I spent so many hours working from, I knew I wanted to document it somehow because honestly, I wasn’t quite ready to say goodbye. Sharing the space with all of you however, felt like a good way to leave it behind. I’m eager to start decorating my new workspace but it’s always hard to leave one behind. You can read the Glitter Guide article here. You did a great job. It looks lovely! I read the article and loved it! You look gorgeous and your space is AMAZING! Your workspace looks awesome. What a great way to say goodbye to it. I hope you’ll share your new one too. You have such a sweet and very inspiring work corner ! Love your work space. Your desk is amazing. What a gorgeous space! I’m glad you were able to document it. Good luck with the move! Love this! Your office is lovely and your outfit is so sweet! LOVE it! It’s gorgeous:) What do you do? I adore that little white elephant on your desk, where is it from?? Thanks for giving us a peek into your work space – love it! So beautiful! Love all the personal details you have in your office!! Lovely pants! Love your office decor and you outfit!! That top and those pants are so glamourous! Where is your desk from? Looks amazing,a beautiful working space always makes me so much more productive!I would decorate my office space in the same way. As I’m going to be moving myself soon as well, I will use this a source of inspiration. The books with flowers on top are such a beautiful detail. i love this! everything looks so classy. in love. Gorgeous workspace! I’m sure your new one will look just as great! Great article and beautiful pictures! You look gorgeous, Rach! Thank you for all of the wonderful pictures of your home that you have shared with us. It is so fun to see that part of your life. I can’t believe you are moving again! I can understand how you’re not ready to leave. But you’ll have so much to look forward to! Beautiful work space. White always creates such a clean and peaceful place to work. You have a beautiful workspapce! Such a pretty office and I love your outfit. I’m a new reader to your blog and I have already fallen in love with it. 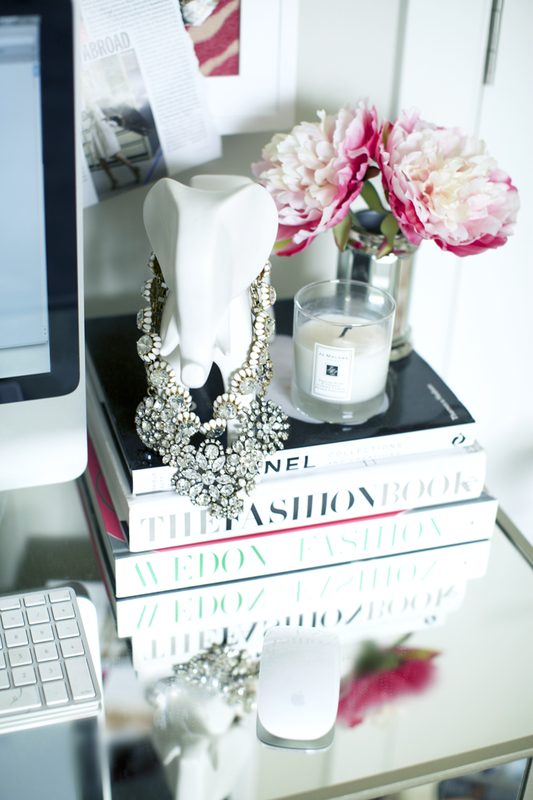 Wow you have created such an amazing workspace, I’d love to have one just as stylish and glamorous as yours is! That big chair looks so comfy! Its fabulous! I’m collecting ideas now I’m moving in January and I like the glamorous look. I LOVE your desk chair! Can you share where it’s from? I am moving as well and will need to re-create my office space as I work from home and I just love your chair! Looks comfy! I love the jcrew necklaces! Loving your work space, so chic!! love your workspace— especially the rug. so cute & peaceful. What a beautiful work space! I love your desk! The mirrored surfaces are absolutely stunning. Thank you for sharing! This is absolutely perfect. I love the outfit you’re wearing as well! So so pretty! I love it! I cannot get over your space! Its a girly paradise, yet super modern and chic. I adore it. Really gives me inspiration for continuing my own room. Gorgeous as always, doll! Such a cute space! Love those pants! It is beautiful, I would be so productive there! Wow it’s so chic! I love it! Love it! :) especially the little stuff that speaks ‘CHANEL’ haha. So glamorous!! You look fabulous in your gorgeous work space. I’m sure your new work space is just as stylish! Obrigada por compartilhar conosco seu lugar de trabalho. Ele é lindo! Have you seen http://www.thecoralcove.com website! Her style is similar to yours! have you seen http://www.thecoralcourt.com website? it is similar style to you! Lovely !!! kisses dear !! I absolutely love your office and your outfit, you look gorgeous. I’m moving into a new apartment this month, I cant wait to decorate my work area. I love seeing you on the Glitter Guide, I hope they feature your new home in the Style at Home section once its complete!